Military Surplus German Esbit Folding Stove with Fuel, Used | BUDK.com - Knives & Swords At The Lowest Prices! Dining while camping just got easier. 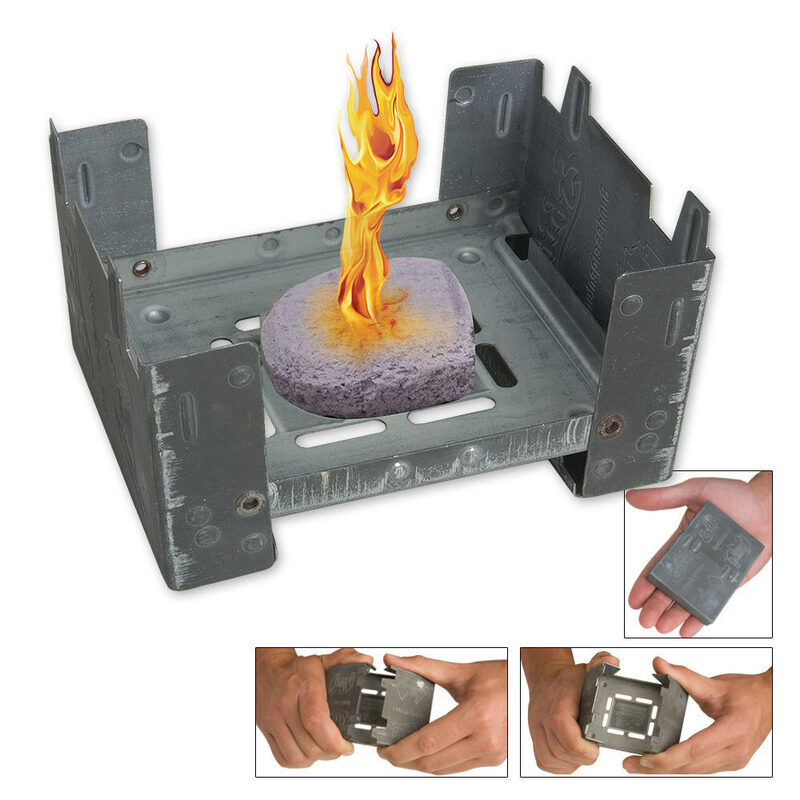 This folding camp stove for a military mess kit is as compact as a deck of cards. The sides fold in when not in use and out when in use to act as wind screens and heat shields to push warmth up to the pot. 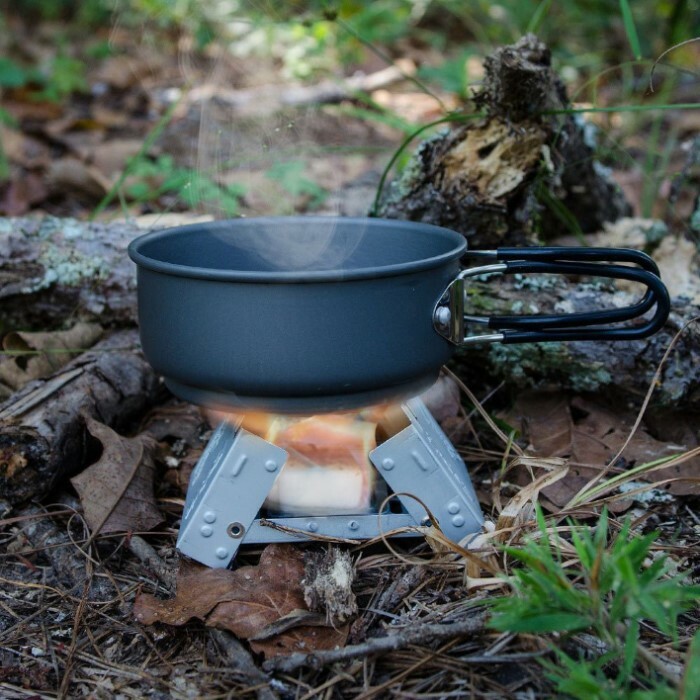 A pack of 3 camp fuels are also included with the purchase and store easily inside the stove when folded. Great little stove! My girlfriend and I brought it out to the woods with a survival knife I had also gotten off of Budk. We brought some loose leaf tea as well as a tin teapot filled with water. The stove was excellent and blocked the wind. The tablets that came with the stove burn very fast and do not produce an overwhelming amount of heat. 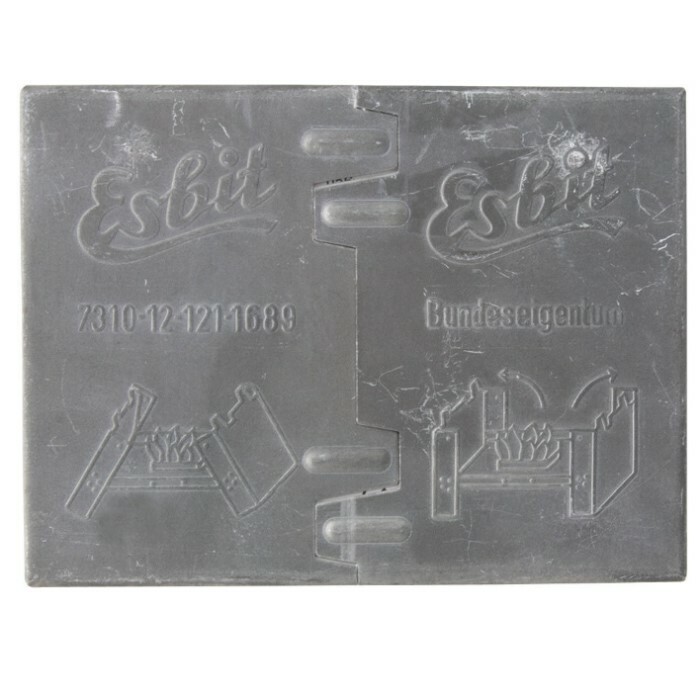 However, Esbit Tablets can be purchased fairly cheap off Ebay. Overall, I would highly reccomend this item to anyone preparing for an emergency, natural disaster, or economic collapse. Used one of these in a real life emergency. My car broke down in below zero weather in the wee morning hours. I went through all of my fuel cubes, but I was able to heat up enough snow to keep me drinking warm water until a cop picked me up. Used it right there in the car. Didn't let out any chemical smell or get me stoned, or anything! I BOUGHT THIS STOVE TO TAKE ON THE JOHN MUIR TRAIL IN JULY. I'VE BEEN TRYING IT OUT IN MY BACK YARD. ITS GREAT! I WILL BE BOILING WATER FOR FREEZE DRIED MEALS, OATS, HOT CHOCOLATE, AND HOT TEA. THE SOLID FUEL CUBE LASTS ABOUT 12 MINUTES. IT WILL ALMOST BOIL 24 OZ. OF WATER WHICH IS PERFECT FOR A BREAKFAST OR DINNER. I'M BUYING TWO MORE TODAY FOR MY GRAND KIDS, THEY ARE DOING THE FIRST LEG WITH ME. A PIECE OF TIN FOIL MAKES A GREAT WINDSHIELD FOR IT. I GIVE IT FIVE STARS. Its a great idea but it lacks...heat? I bought mine at a local army surplus store and when i got it, the fuel smelled like dead fish. i have to keep it in a separate bag so it doesn't stink up all my other camping stuff. it would take more fuel to boil water but it would heat up a can of beans nice. I got another stove that has a 6 hour fuel canister and has a good stand for a pan and heats well. If you just wanna spend a couple dollars on an okay object, this is it. i bought this esbit stove to add to my survival gear and i loved it in the catalog and i love it more in person its not big at all or heavy great everyone should buy this you'll never know when you'll need it.